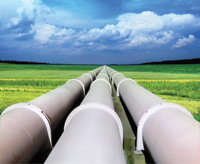 Global expenditure on oil and gas pipelines market is expected to total $60.29 billion in 2012, says a new research report. Oil and gas pipelines are an essential part of hydrocarbon transportation and distribution. Modern pipelines are generally the most economical way of transporting large quantities of oil and gas overland from its extraction point to refineries, storage and consumption areas. The market is constantly evolving and advancing, from making construction times quicker to increasing pipeline capacity. Pipelines are part of a necessary infrastructure required to ensure the smooth operation of the energy industry. No other transportation method has the ability to move comparable amounts of oil or gas. This unique selling point has allowed the pipelines industry to grow over the previous century and this is set to continue for the foreseeable future. Visiongain calculates that global expenditure on oil and gas pipelines in 2012 will total $60.29 billion. Regardless of the current tentative global economic situation, demand for oil and gas still remains strong and is likely to remain so over the coming ten years. Connecting unconventional and offshore oil and gas to consumption centres will also help drive the market for oil and gas pipelines, says the report titled the ‘Oil and gas pipelines market analysis 2012-2022’. The growth in the oil and gas pipelines expenditure will be fuelled by the emerging countries of China, Brazil and Venezuela as well as some mature markets such as Canada and Russia. The overall spending on the oil and gas pipelines systems will depend on the future oil price developments, the level of natural gas demand and the expansion of unconventional oil and gas activity. Demand for energy is expected to rise significantly during the forecast period 2012-2022, despite the fact that in the short run the growth will be hampered by the Euro-zone crisis and declining economic growth in emerging countries, the report notes. Though the industry will be faced with the restraints of a weak global economy, political instability in certain parts of the world and the expansion of LNG infrastructure, the oil and gas pipelines market is likely to provide substantial opportunities for potential investors. As part of its bid to diversify its gas exports and decrease reliance on traditional transit countries, Russia will construct more pipeline than any other country in the world over the next few years, says another latest report. Industry analyst specialist GlobalData’s latest report 'Planned Oil and Gas Pipelines – Global Market Analysis, Competitive Landscape and Major Projects to 2016' analyses the global planned oil and gas pipelines market. 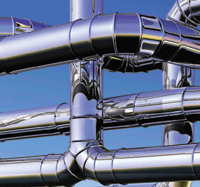 The report provides information about the global planned pipelines market until 2016 and also provides key trends and issues in the pipeline industry. The new report states that Russia’s vast pipeline additions will largely focus on finding new markets for its gas exports, while simultaneously bypassing traditional transit countries such as Ukraine, Belarus and Georgia. During the period 2012-2016, the Eastern European nation will build a massive 14,053 km of pipeline, accounting for 15 per cent of the pipeline length to be constructed globally during this time, and a 63 per cent share of the European total. The region with the greatest pipeline additions, however, is the Asia-Pacific, thanks to huge projects expected in India and Myanmar, among other countries. India will be responsible for 10,965 km of additions by the end of 2016, which equates to approximately a quarter of the continent’s pipeline construction. Gas consumption in India is on the rise while production is declining. In response, the country is planning to boost imports and needs to develop its pipeline infrastructure to cope. Pipeline construction in Myanmar is in no small part due to China’s need to improve its oil and gas import routes. Two of the biggest planned projects in the region are the Myanmar-China oil pipeline and the Myanmar-China gas pipeline. The Myanmar-China gas pipeline has a transportation capacity of 423.60 billion cubic feet (bcf) and is currently under construction, as is the Myanmar-China oil pipeline, which has a transportation capacity of 158.4 million barrels (MMbbl). The Asia Pacific region will introduce a total of 39,597 km of pipeline additions during the period 2012-2016, most of which will be employed to meet the growing demand for natural gas across the continent. Meanwhile, the length of China’s oil and gas pipelines reached more than 90,000 km by now, more than triple that of in ten years ago, while the country will still witness a rapid expansion of oil and gas pipeline networks in the next 5 to 10 years during advent of the fresh peak period of oil and natural gas pipelines construction says Zhao Yujian, head of China Petroleum Pipeline Bureau of China National Petroleum Corporation (CNPC). According to Zhao, the oil and gas pipeline length was less than 30,000 km in 2004. The peak period will last five to ten years and is marked by the commencement of building with the 3rd West-to-East natural gas pipelines and line-C of Central Asia natural gas pipelines, says Zhao in a recent interview, without giving his estimation on the newly added pipeline length. Zhao says China is working on the planning of the 4th and 5th West-to-East natural gas pipelines and would kick off the building of 4th Shaanxi-Beijing natural gas pipelines in 2013. The construction of line-D of Central Asia natural gas pipelines is expected to start in 2013 following the launch of building work with line-C in September 2012, according to Zhao. The capacity of Sino-Russia crude oil pipelines crossing northeast China would be doubled to 30 million tonnes from 15 million tonnes with Sino-Russia natural gas pipelines under planning, Zhao says.